So, to continue this series of conversations, here is Doug Shultz, director/producer/writer of Defiant Requiem. sings to them what they dare not say. Doug Shultz: Since I was a kid, there was never any doubt that I wanted to make movies. In college I was a film major, but I also was also studying so many other things, from African studies to linguistics and performing arts, I didn't want to give any of that up. So the best way for me to combine all of those interests was to shift my focus to documentary. Now I get to indulge my main passion—making films—while remaining a perpetual student. IDA: What inspired you to make Defiant Requiem? out what the film was going to be. But the real inspiration and motivation for all of us was just what an astonishing story this is. What Schächter and the other inmates at Terezin did was absolutely epic. It deserved to be done right. we settled on a restrained kind of dramatization-just enough to pull the audience into the world of Terezin in a cinematic way, but without going over the top. DS: The film evolved from a concert film into a film about bringing a concert to Terezin, into a historical film that uses a concert as its catalyst and narrative thread. As often happens, the focus narrowed tremendously as we got into the edit room and really started zeroing in on what was most powerful and most necessary for the story. Once we started going through the interviews and putting the script together, it became clear that the film really belongs to the survivors and to Raphael Schächter, and that his story would be representative of everything else that was going on at Terezin. IDA: One editing question: You work with two story lines-one, the foundational one of Raphael Schächter instigating and inspiring his fellow prisoners at Terezin to perform Verdi's Requiem as a visceral act of affirmation, defiance, revenge and hope; and the other, the present-day one of Murry Sidlin bringing this powerful story to life with an equally affirmative performance in the very same venue. Talk about the process of creating this structure of past and present informing one another. powerful and transportive—they bring an emotional weight to the story that no words ever could. So we capitalize on this by drawing a connection between the build-up to Murry's memorial concert with the lead up to the first performance of the Requiem by Schächter's choir. IDA: As you've screened Defiant Requiem—whether on the festival circuit, or in screening rooms, or in living rooms—how have audiences reacted to the film? What has been most surprising or unexpected about their reactions? DS: The reaction so far has been overwhelming, and most have fallen along similar lines: In general, people have been astounded by this incredible story, which they never knew, and have been captivated by the amazing, expressive survivors in the film. It's also interesting to see people moved to tears by the music-it's a testament to its power and to why Schächter chose the Requiem in the first place. The best feedback, though, has been from the survivors, who loved the film and said, "You got it right." inspiration in the true sense of the word. I also loved his later film, The Agronomist. One of my all-time favorite docs that had a big impact on me was David and Laurie Shapiro's Keep the River on Your Right. Some other recent favorites are The Cove, Man on Wire, Bowling for Columbine, The Island President...I'm a visual person, so I draw as much inspiration from features as I do from documentaries. I like docs that tell a real story, but draw you in like a feature film. August 3 through 9 at the IFC Center in New York City and August 17 through 23 at the Laemmle NoHo 7 in Los Angeles. 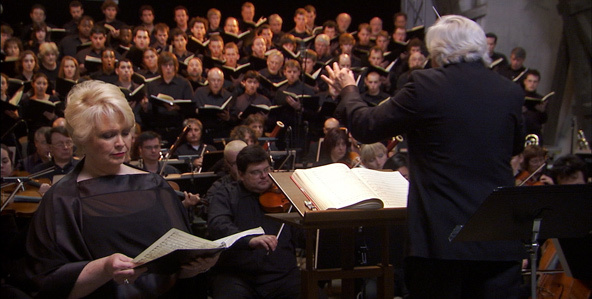 To purchase tickets for Defiant Requiem in New York, click here. To purchase tickets for Defiant Requiem in Los Angeles, click here.